America and Canada aren’t near a NAFTA deal and time is short. U.S. lawmakers have said they won’t accept the U.S.-Mexico only pact favored by Trump, but some have criticized Ottawa. If they back down, there’s little hope for any meaningful brake on steel tariffs and the like. 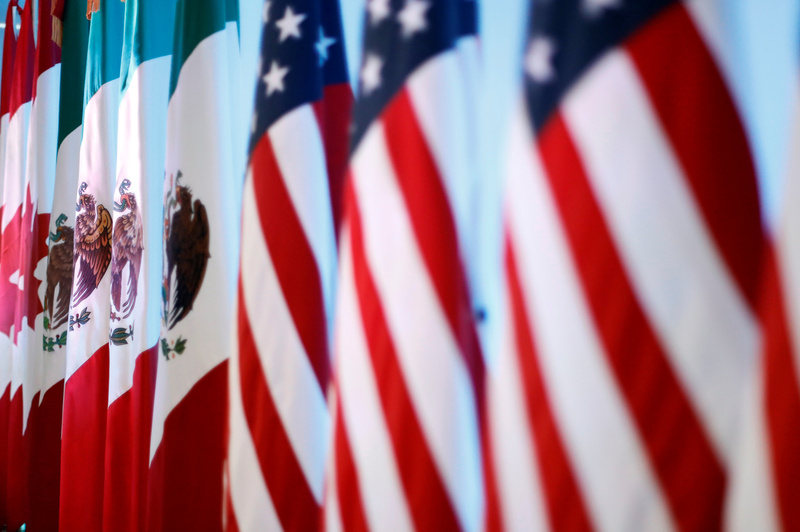 Flags of Canada, Mexico and the U.S. are seen before a joint news conference on the closing of the seventh round of NAFTA talks in Mexico City, Mexico March 5, 2018. U.S. Trade Representative Robert Lighthizer said on Sept. 25 that there is still a “fair amount of distance” between America and Canada in their efforts to renegotiate the North American Free Trade Agreement. Speaking at the Concordia Annual Summit in New York, Lighthizer also said "we're sort of running out of time." The USTR notified the U.S. Congress on Aug. 31 that it plans to finalize a trade deal with Mexico at the end of November, and Canada could join “if it is willing.” The parties have until Sept. 30 to release the text of an agreement. Canada rejoined the talks on Aug. 28 after Mexico and the United States had held bilateral discussions for about five weeks.